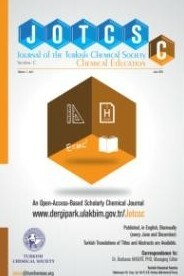 JOTCS-C (Journal of the Turkish Chemical Society, Section C: Chemical Education) is an international, peer-reviewed open-access journal which evaluates innovative applications ranging from secondary education to university education and which publishes research articles and review articles containing in-depth analyses directly related to the chemical education. It is published in every September and March (biannually) and it is published in Turkish and English. Double-blind reviewing is applied. In the journal, book reviews about secondary- and university-level, national and international chemistry textbooks, other sources about chemistry, and book reviews in the teaching and education of chemistry will be covered. In addition, a systematic review about teaching a specific chemical topic or experimental samplings about laboratory teaching can be placed in JOTCS-C. This open-access journal is licensed with Creative Commons Attribution 4.0 International (CC_BY_4.0) license and supports Budapest Open Access Initiative. Our journal does not require any article processing fees or submission fees.